National Cartridge Co. brand print cartridges for inkjet and laser printers. 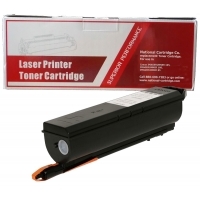 National Cartridge Co. offers many different compatible branded print cartridges for laser printer, multifunction and inkjet alike. On our site, you have access to only the most popular and recommended compatible print cartridge brands such as EcoPlustm, Premiumtm, and Blue Elitetm. All cartridges are intalled with up to 5 new imaging components. Post print tested to assure excellent print and copy quality. Professionally packaged with Balloon insert to encapsulte and cushion the cartridge against damage during shipping. NCC cartridges have a lifetime warranty against defects in function and in print quality. Cartridges must be partially and not fully depleted of toner for this warranty to be in effect. The user-friendly search tool will help you find NCC cartridges by make and model. Under the Product type search select box, choose "NCC TONER". I hope that our toner cartridge search tool really helps you hone in on the specific products you need -- so you can get in, find it, buy it and get it delivered quickly. CANON GPR1 1390A003AA GPR7 6748A003AA F42-3001-700 compatible Black copier Toner cartridge. CANON GPR10 7814A003AA compatible Black copier Toner cartridge. CANON GPR10 7815A004AB compatible Black copier Drum cartridge. CANON GPR11 7626A001AA NPG22 compatible Yellow copier Toner cartridge. CANON GPR11 7627A001AA NPG22 compatible Magenta copier Toner cartridge. CANON GPR11 7628A001AA NPG22 compatible Cyan copier Toner cartridge. CANON GPR15 9629A003AA GPR16 9634A003AA NPG25 NPG26 compatible Black copier Toner cartridge. CANON GPR17 0279B003AA compatible Black copier Toner cartridge. CANON GPR18 0384B003AA compatible Black copier Toner cartridge.